This is the first of two GM-Trucks.com 2020 C8 Corvette exclusives. See at the end of the article for more details. Images of the C8 mid-engine Corvette logo have been out in the open since late November. They showed up on a leaked key fob undergoing certification last fall with the FCC. 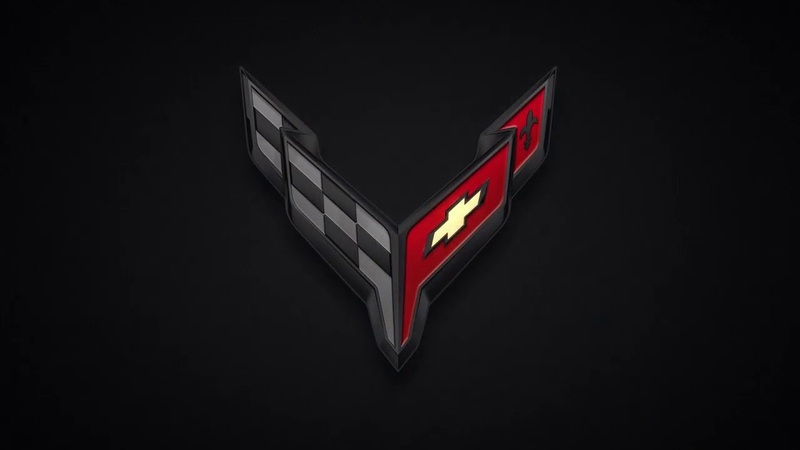 The internet has run wild with speculation since but no-one has gotten their hands on a real digital version of the 2020 Corvette's logo. Only enthusiast renders based on the leaked fob.... Until now. GM-Trucks.com has the first exclusive look at the official logo in digital format. We won't comment specifically on how we obtained it. We can say it was obtained from publicly available files by a third party and passed along to us. Tomorrow, we'll give you the very first look at the 2020 Corvette's dash cluster start up animation. Last edited by John; 03-31-2019, 11:46 PM. Looking forward to seeing the photos and of course the animation for tommorow. Info keeps breaking. Wonder when GM starts to realize that if we do not reveal it soon, most will already be out? Ready to see tomorrow’s info. That’s my feeling as well. I know GM hasn’t officially said anything but at some point it just goes without saying. Then the longer it’s drawn out the more likely people are to walk away and not even wait to see what it looks like. Info keeps breaking? Are you getting other info and news! We already got the key, logo, interior, CAD drawings, front and rear fascia and tyres. Plus we got credible intel on models, price, horsepower and strategy. So, yeah there's a lot. I meant the questions as if it appeared there was more news today. As far as I know none of it is official or confirmed. Also according to many the interior shots are preproduction and the steering wheel isn’t accurate. What are credible source on models and price? Those have both been all over the place. I would call that most of that speculation not breaking news. 14 months before the C7 was leaked, on November 14, 2011, someone provided Jalopnik the actual GM drawings of the Z06 version.. They were confirmed to be exactly that at the reveal. This time of course, we do have exciting renderings, but no GM official drawings. And in response to one question above, nothing additionally new is coming out today that we know of. Last edited by John; 02-06-2019, 05:51 PM. Looking forward to this! - "Tomorrow, we'll give you the very first look at the 2020 Corvette's dash cluster start up animation. " We have made progress peeling off layers of this onion, but ****, why does it have to be the largest onion on the planet, with 1,000+ layers we have to peel off in succession. I agree John unfortunately the marketing team handling this reveal needs to go back to school. Porsche and many other high-end manufacturers do a much better job controlling anticipation and revealing their cars. If GM wants to attract the upper scale buyer from the other brands they will need to do better. Just releasing the car won't be enough, Hopefully years later we will get a book or a documentary about what happened. Last edited by Fasttoys; 02-06-2019, 10:19 PM.